Holiday gift giving can sometimes be a pain, because you are clueless as to what original yet meaningful handmade gift you’ll give your awesome friends and family. Going out and buying gifts is fine and all, but there is something about putting a gift together for that significant person in your life that makes it that much more special. And it often beats having to stand in line for hours during the busy holiday rush. To make your handmade gifts a success, its great to have some clear wrapping paper great for some of the DIY gifts below. Even some basic brown wrapping paper that you can play up with personalized wrapping (like the last cute pom-pom image for gift wrapping) can help make your gift more meaningful and helps you stray away from generic wrapping paper. Not to mention it’s always nice to save money on gift giving and successfully make it through the holidays without busting your budget. To help you do that, I created a holiday gift list printable page you can download below. Stick it in your planner (the page is letter sized) for when you’re ready to do some holiday shopping. DOWNLOADIf you’re looking for some handmade gifts ideas and inspiration, here are 21 thoughtful gifts for the clueless giver. This one is for the foodie in your life. The huge teacup like bowl brings it all together beautifully! You can fill it with kitchen utensils, spices and common cooking ingredients. Basically, just personalizing it to fit their tastes— whether they love baking or grilling out. There are lots more of these goodie basket-like ideas you can check out here. Do you have a collector in your life? Make them some vintage collectible teacup candles! They are beautiful, can serve as house decor, and it’s definitely not something you see around a lot. Making them yourself makes them extra special. Check out how you can make this DIY gift here. These are great for kids as stocking stuffers. It puts a new spin on just stuffing random candies in a sock. Putting extra thought into the gift makes it extra special and memorable. And you can build more than a sleigh with candy, there are countless tutorials out there on different ways to put candy together. Crayon candles are super easy to put together and make for a lively and colorful gift idea. One simple hack to personify the candles even further is to find different glass shaped to pour the wax in, like heart-shaped ones or even bowl-shaped. Try out the tutorial here. This one is absolutely cute and its perfect for the coffee drinkers in your family. It’s actually a video tutorial that you can watch here and it makes for a highly personified stocking stuffer or a stand-alone gift. As a bonus you can even stuff it with their favorite coffee beans. Make a tea wreath for the holiday get together! This is great for people that love tea because it serves as a wreath and a diverse tea collection at the same time. you can even pair it with the chalkboard coffee mug for the perfect duo. This ornament was too cute to pass up and not include in the list. Its great for people that take Christmas extra seriously and collect different ornaments perfect for their tree each year. Not to mention its also great if you are into sewing. If not you can always use a glue gun to put different designs together. These glasses are so useful and can be paired with their favorite wine bottle! Why not make a set of personified glasses for the wine drinker in your life so they are always drinkin’ pretty? They are easy to make and affordable. You might have to spend a little more on the win than anything else. This is yet another great git for someone in your life that loves the kitchen. It can also double as a stocking stuffer. 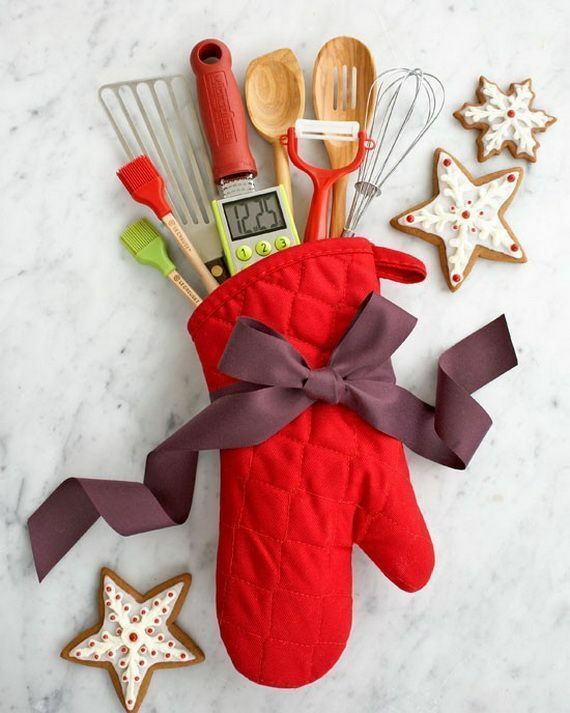 Just buy a pair of baking gloves, some ribbon, and your favorite kitchen utensils to stuff it with! This is one of the cuter DIY gifts on this list. I would LOVE this gift to either put on my vanity, in the kitchen, or even for my bathroom counter to hold all my nail polish. Check out the tutorial and see how easy it is to make this gorgeous tiered gift. Edible gifts are always a safe go to because you don’t have to worry too much about regifting or if they liked it enough to actually use. So this is a great project for a quick gift that is likely to delight. Even if they aren’t wine drinkers you can always buy a sparkling apple cider bottle as the base. Slippers are great. Slippers stuffed with useful trinkets are even greater. Easy to put together and it won’t go unnoticed because who in the world doesn’t like a pair of comfy slippers? Put it together in some clear wrapping paper and a big fat bow and you’ll be good to go! This one can be used as a cute ‘hint’ giving gift if you know what I mean. Tell that special person in your life that they might need to start saving a little more with this awesome personified savings jar. You can even make a whole set of them and designate them for different things, like a swear jar, a self-improvement jar, or a laundry money jar. They are gorgeous and easy to make with this step-by-step tutorial. This cushion is adorable and useful year round. The key is designing it so it fits their particular style and color preference. Adding a little accessory like the star pictured here brings it all together nicely and adds a nice personal touch. You can also buy premade cushions are the store for a low price and add your own decorations to it. It’s all about being gift savvy and personalizing it. Who wouldn’t like to receive a mint sugar scrub?! Well, maybe not your grandpa, but it hits the target with the special ladies in your life. Sugar scrubs are the easiest things in the world to make and if you package it nicely, you’re in for a winning gift. Learn how to make a variety of scrubs with this tutorial. A light up carpet hits all three points at the same time: Unique, personal, and useful! There might be a bit of a learning curve involved as you need to learn to crochet to successfully put the light up carpet together, but once you do, I’m sure you’ll be proud of the result. Coasters are great accessories to any house. Make some matching coasters for your their kitchen/living room and they’ll be sure to love them. You can either combine them into a goodie gift basket or use them as stocking stuffers, your choice. These shell candles are BEAUTIFUL. Who can resist a gift like this when you don’t see it everywhere? Get the tutorial here and see how you can put it together. One of the perks is that it’s a beautiful gift that doesn’t have to burn a hole in your pocket. Make a mint bowl! Now here is a new way to use candy to your advantage without it giving you cavities. Just melt some mints together and create a mini bowl to hold other things. To wrap up (no pun intended) this list I wanted to add a cute way to include pom poms that double as a gift and gift wrapping. There are plenty of tutorials out there on how to successfully put together a pom pom. And they beat the tradtional plastic bow. Hows that for a quirky approach? Hopefully these ideas helped spark other holiday gift ideas for you, or maybe you’ll even try some of them (they’re all too pretty to choose only one!) I like the idea of making giving holiday gifts easy because that way you actually enjoy the time off you are supposed to have with your friends and family and make the best of it. No waiting in long lines or stressing about what you can buy. It always adds a nice touch when you took the time to personify your handmade gifts and put some actual thought into them. Happy gift giving!